Armenia is a mountainous country in Eurasia, which stands landlocked between the Black Sea and the Caspian Sea in the Southern Caucasus. 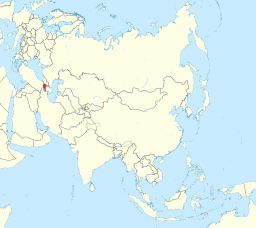 Its stands bordered by Turkey in the west, Georgia in the north, Azerbaijan in the east and Iran and that Nakhchivan enclave of Azerbaijan in the south. Armenia is home to the Armenian mouflon, Bezoar Ibex, Mideastern brown bear, wild boar Asian deer and several other species of interest to collectors, such as the Golden Jackal and Asian Swamp Cat. When hunting in Armenia, most often accommodations are in small bed and breakfast guest houses in the villages near the hunting areas. Here we find the level of service very good, as is the food and other amenities. Multiple forest service roads in the reserves lead to the peaks of the mountains, which makes this hunt easier in comparison to sheep and ibex hunts elsewhere in the Middle East. It is not necessary to obtain a Visa to travel to Armenia, provided your visit is less than 180 days. Recommended travel brings hunters through Vienna into Yerevan Internation Airport in Armenia.